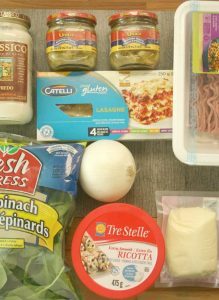 I was really excited to find Gluten Free Lasagna Noodles at my local Supermarket. 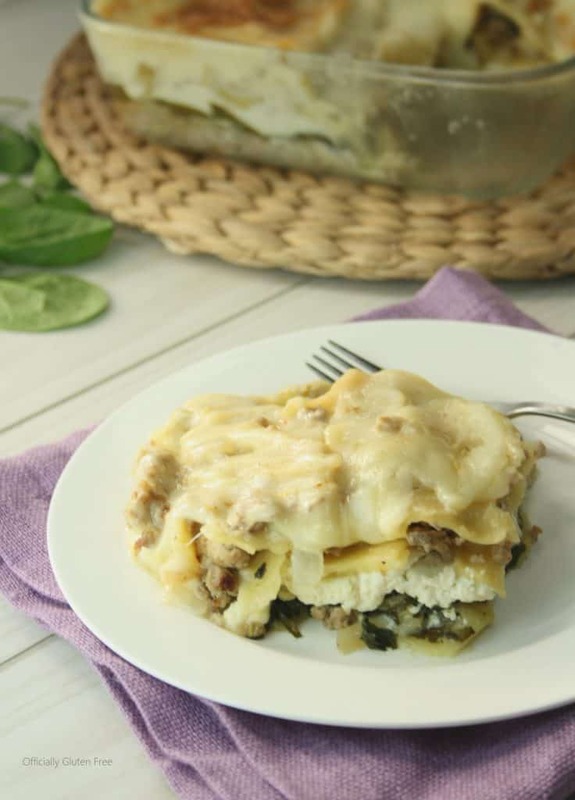 I used them to make this Spinach and Artichoke Lasagna using Turkey instead of Beef. Turkey is much Leaner and more affordable. I actually prefer the Taste of Turkey over Beef but if you don’t, just use beef instead. The Spinach and Artichokes go Perfectly with the Alfredo Sauce and Turkey. 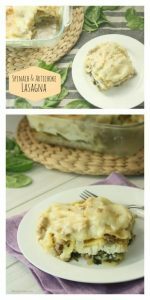 I think it’s a Wonderful Change from regular Lasagna made with Beef and Tomato Sauce. It’s so Creamy and Flavorful. It’s a Perfect Dinner for a Cool Fall Day. 2. Fry the ground turkey until fully cooked. Dice the onion and artichokes, then add to the pan with the turkey. Cook for 5 minutes. Set to the side. 3. In the bottom of lasagna pan spread 1/4 of a cup alfredo sauce. Then add 1 layer of the lasagna noodles. Spread 1/4 cup of alfredo sauce over the noodles. Cover the sauce with 1/2 of the meat and artichokes. 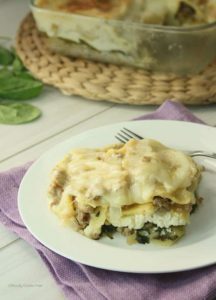 Then cover with another layer of lasagna noodles. Spread 1/4 cup of alfredo on top of the noodles, then lay the spinach flat on top of that. 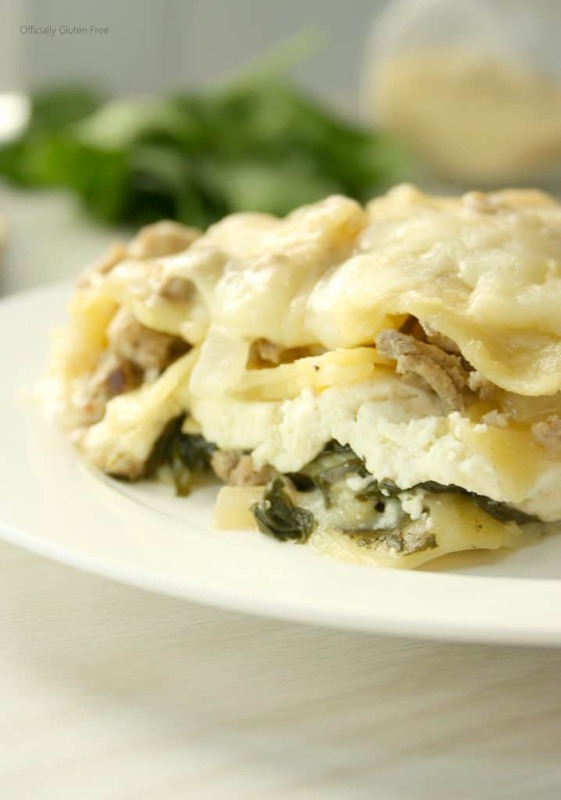 Cover the spinach with the ricotta cheese then cover that with a layer of noodles. Spread another 1/4 cup of sauce over the noodles then spread out the rest of the turkey and artichokes over that. Cover with noodles, then spread the last of the sauce over that. 4. Cover with tin foil, then bake for 45 minutes. Remove the tin foil then spread the mozzarella evenly over the top. Bake uncovered for another 15- 20 minutes.